Jun Kaneko dango Leaves Holland Center | Blog | Davis Erection Company, Inc.
Davis Erection workers maneuver an 11-foot, 3,000-pound dango, created by artist Jun Kaneko, toward a padded case for transportation “like an egg in a crate,” as one worker put it. The artwork was being moved Tuesday from the Holland Performing Arts Center to Kaneko, 1111 Jones St.
How do you move a dango? Slowly and surely. 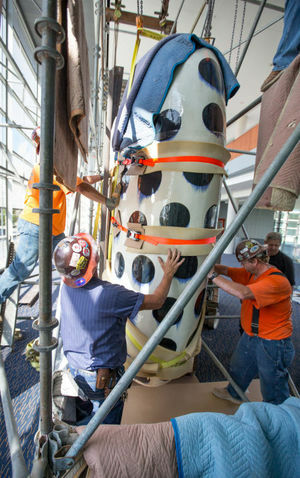 Workers took on the logistically demanding task Tuesday of extracting a 3,000-pound ceramic sculpture by world-renowned Omaha-based artist Jun Kaneko from the Holland Performing Arts Center. The dango, as Kaneko's towering, vaselike sculptures are called, was being relocated to the Kaneko creativity center at 1111 Jones St. There it joins five sibling dangos that were moved out of storage Monday, reuniting a series Kaneko made in the early 1990s. “We've never shown all six together,” said Ree Kaneko, the sculptor's wife and partner. The sculpture had been on loan to the Holland Center since it opened in 2005 and sat prominently in the second-floor lobby overlooking the Gene Leahy Mall. Moving it required the construction of 20-foot scaffolding surrounding the mammoth artwork. Over the course of an hour, five workers from Davis Erection carefully brought a cage up to the dango, lifted it off the floor using pulleys and then moved the artwork into a the padded transport cage. “Like an egg in a crate,” said one of the workers. True enough, it looked like an avant-garde Humpty Dumpty held together with towing straps and foam, an unusual challenge for a work crew more accustomed to moving steel. Conrad Snider, a ceramic artist from Newton, Kan., and longtime collaborator of the Kanekos, directed the effort. Besides his interest in the artistic nature of the work, Snider said, he is intrigued by the logistics of transporting and displaying such art. Over the years, he has witnessed Kaneko's work grow in size, and with it the demands of moving it. The key to leading such an effort: Keep calm and go slow. “You want to take your time and not be rushed,” he said. Visitors to the Holland Center over the past eight years could be forgiven for thinking that the “polka dot” dango, as Ree calls it, was a permanent part of the building. From the beginning, it has been a noteworthy element of the venue, a whimsical flourish to the Holland Center's modernist interior. But the original plan called for the sculpture to be displayed for just one year. After that, the Kanekos intended to bring the six related dangos under the same roof. Then a year passed, and another after that. One year became eight. The plan became more urgent as the nonprofit Kaneko center engages in a capital campaign to fund a new addition that will house its art collection. That prompted the organization's board of directors, including founders Jun and Ree Kaneko, to put some of that art on display. The six dangos now at home at Kaneko were completed in 1994 in Fremont, Calif., inside an old sewer pipe factory. At the time, they were the largest sculptures Kaneko had made (he has since created dangos 13 feet tall). The collection will be unveiled at an exhibit called “Jun Kaneko's Special Project — Fremont Dangos,” opening Sept. 20. The show will also feature a video about the project, as well as drawings created around the same time. As for the Holland Center, it won't be dango-less for long. Today, workers will install a brand new Kaneko piece, just weeks out of the kiln. The colorful, 10-foot-6-inch sculpture, donated by a patron to Omaha Performing Arts, is intended to be permanent.